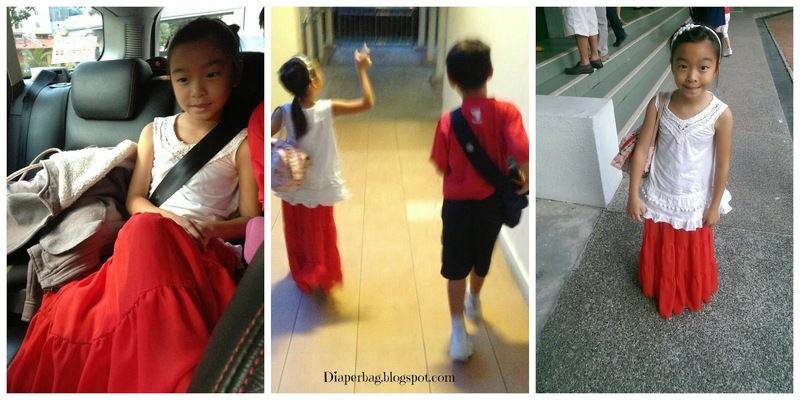 National Day celebrations in school has always been the annual rummage through the drawer for something red and something white to wear. Tangentially, we've come to the conclusion that Jordan's school is a very conservative and 'proper' mission girls school. Other mission girls schools allow their younger girls especially, to go to school in PE attire and spend the rest of the day in the same gear till dismissal on PE days. I had naturally assumed that Jordan would be allowed to do the same, only that she isn't. She is expected to change back into her uniform because 'proper' girls don't spend the day in PE clothes. So it came as no surprise that she was given a long list of guidelines to follow for her National Day attire. And that drove me slightly batty. 3. It had to be RED or WHITE with no other colour prints. 4. Only stripe and dot derivatives were allowed. 5. Skirts/ shorts and dresses had to reach the knees. 6. If they didn't, leggings had to be worn. Leggings had to be white. 7. Shoes could not have heels or wheels. No slippers either. As Jordan rattled off the list, I pictured her in something resembling and red and white burqa which I was very certain, her Christian conservative school, would not be able to find funny and I would very quickly get called into the principal's office for. White and red were bad enough. The white shorts we ended up pulling out were too short. The leggings I paired with it had pale grey stripes on it. Same response to the possible skirt options. The white tops we had were all sleeveless and Jordan vetoed it. Eventually, the option was to go nekkid or in uniform and while she was happy to go in uniform, I was determined get it right and if possible, use it as a statement of how ridiculous I found some of the guidelines to be. So this was the eventual ensemble that we put together. When she pointed out that her top was still sleeveless, I pointed out that the material on the end of the skirt more than made up for it. She also pointed out that her skirt was too long and it would be difficult to go to the washroom if it were wet. I told her we couldn't always win and she just had to hike up her skirt like any other 7 year old would do. And that way, NO ONE could query her length of skirt. The little girl who HAD to do it as the rules stipulated was having a lot of cognitive dissonance from a mother who insisted on showing her that there was middle ground. Incidentally, I had also known that the sleeveless top wasn't going to get her into trouble because the aforementioned rules were Jordan's interpretation of it and not really what the teacher meant. I think she and her school deserve each other. I shall also enjoy and treasure these days where she loves the long swishy skirts and where "You mean you're going to go out wearing that?" is not about a battle of how short and revealing her clothes are but how hot she might be.